Down screen, pin down or coming off screen – whatever you call it, Real Madrid creates numerous open looks with the action. 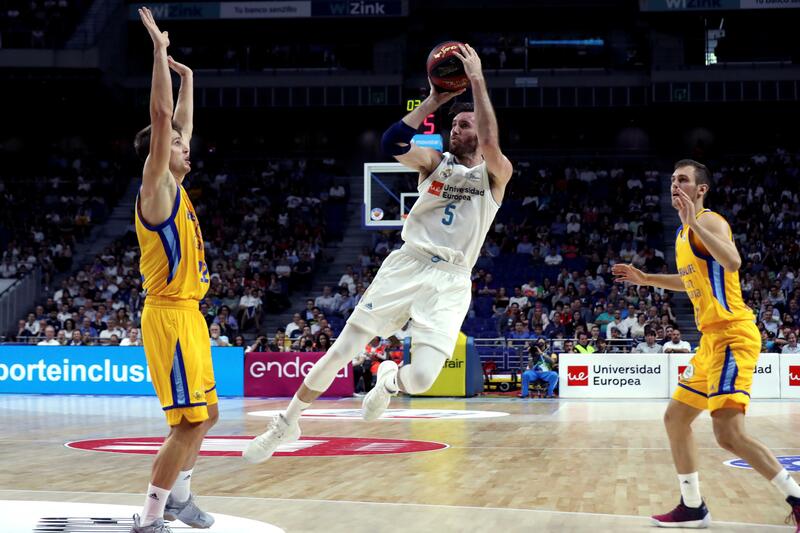 The reigning EuroLeague Champion, Real Madrid, are looking for a second title in a row. This season the squad is off to a great start in league play, currently sitting in second place just behind Fenerbahce Istanbul. Real Madrid have strong, balanced roster, but what makes it unique? How about having some of the best shooters in Europe in Jaycee Carrol, Fabien Causeur, Rudy Fernandez and Klemen Prepelic. Head coach Pablo Laso really plays to this strength in running an offense that creates “coming off” or pin down/down screen situations for his shooters. Lets take a closer look at some of these specific sets from the team in the Spanish capital. Click on a play to download it to your FastDraw library. This is the one of the most used plays in Coach Laso’s playbook. It involves a lot of movement and misdirection, which ends in a “double exit” situation for 2, who can fake or drag his defender to create 2-on-1 situation, when coming off screen. If the defender goes under, 2 makes him pay with a jumper. If the defender chooses to lock and trail, this is a shot or curl to the basket. And if the screener’s defender helps, then it’s an easy slip or pass into the post for the mismatch. 1-5 PNP, 5 plays DHO with 3, Double Exit action. This play looks very simple at first. But as we take a closer look and imagine 2 coming off the triple screen, if he can’t shoot he curls around and comes off the stagger screen. In the end, x2 must defend five screens in one possession against a really good shooter – eventually, there will be a mistake to create an opening. 2 comes of a triple screen, then 3 comes of a stagger and gets the ball from 1. 2 uses a stagger screen to get an open look. This a quick hitter out of Horns formation. Here Real Madrid create an open space on top of the court for playing coming off, or pin down, situation. If 3 can’t shoot immediately after the catch, he could attack downhill or play a top PNR with 5. 5 sets a wide pin down for 3 after 1-5 PNR, 4 makes a cut to the strong side corner, 2 runs to opposite corner. For what it’s worth, this is my favorite set play in Real Madrid’s playbook. Very unusual set with lots of misdirection, often leading to an open look for RM’s shooters. The first option here is to play a ‘comeback screen’ for 2, in which 5 immediately turns and sets when 4 initially has the ball in the corner. 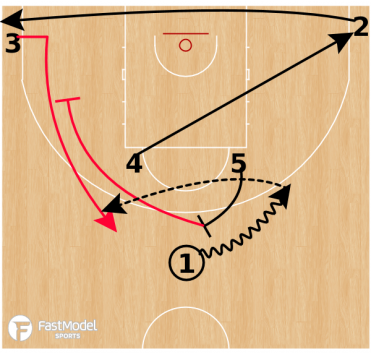 The counter is to play a stagger screen for 3 coming from the weak side, set by 2 and 5. 4 sets a wide pin down for 2, who then plays DHO with 1. 1 passes to 4 and spaces out to the weak side. 1st option: comeback screen for 2. 2nd option: stagger screen for 3. This is the most used inbound set play by Real Madrid as it includes several options. The first option is to use 5-3 back screen, because if x5 does not bump 3, it is immediately two points under the basket. The second option is a pass to 5 who then looks for 1 coming off a wide pin down set by 4. The play ends with Floppy action, where 2 and 3 comes off down screens from 4 and 5. Also see the final frame, where 2 and 3 have the option to screen for each other before using the pin downs. 5-3 back screen, 5 gets the ball on the 3pt line. 1 comes off 4’s pin down to get the ball from 5. Floppy action to finish. BONUS SET from Kostas Kalogeropoulos!